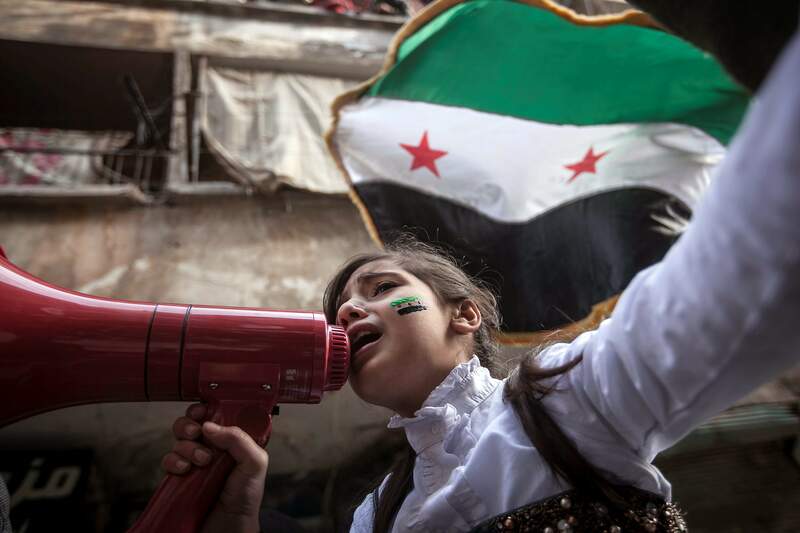 A Syrian girl chants slogans during a demonstration after Friday prayers in the Bustan Al-Qasr district of Aleppo, Syria. After months of fighting, thousands of residents have returned to the city as they attempt to return to their daily lives while heavy fighting is still taking place along the front lines in the city. BEIRUT  Internet and telephone service were restored across much of Syria on Saturday after a two-day, nationwide communications blackout that came during some of the worst fighting to hit the capital since July. Experts say the shutdown likely was caused by President Bashar Assads regime, raising fears that the government is taking increasingly bold measures to cut off the country from the outside world as it tries to crush a relentless rebellion. Mobile telephone networks also appeared to be mostly back up Saturday. A Britain-based activist group, the Syrian Observatory for Human Rights, said it was receiving dispatches from many parts of the country. Many landlines had remained in working order. The SANA state news agency said technical teams brought both Internet and telephone services back online Saturday in Damascus and its suburbs  the flashpoints of recent fighting between government soldiers and rebels. Syrian rebels are fighting a 20-month-old revolt against the Assad regime. Activists say 40,000 people have been killed in the crisis, which began with pro-democracy protests but has morphed into a civil war. On Saturday, Syrian troops backed by helicopter gunships clashed with rebels as government forces pushed a major offensive on villages and towns near the capitals international airport, activists said. SANA reported a car bomb exploded in the Damascus neighborhood of Ish Alwarwar. There was no immediate word about casualties. The fighting during the last few weeks in Damascus is the most serious the capital has seen since July, when rebels captured several neighborhoods before a swift government counteroffensive swept out the opposition fighters. Activists said forces loyal to Assad were battling rebels in towns just south of the capital, including Aqraba, Beit Saham and Yalda near the airport. The Observatory said many were feared killed in government shelling of Beit Saham. Syrian state TV said troops were battling fighters from the al-Qaida-inspired Jabhat al-Nusra group in areas around the airport and that many of the rebels were killed, including two Iraqi citizens. Syrias Information Ministry said the airport was operating as usual and that the road leading to the facility is totally secure. The road was closed Thursday because of heavy fighting, but authorities reopened it Friday after troops secured the area, activists said. The Observatory also reported clashes in the southern Damascus neighborhoods of Tadamon and Hajar Aswad, which have been hit by heavy fighting for weeks as the rebels try to push back into the city. Government troops were also heavily shelling the Damascus suburb of Douma, local activist Mohammed Saeed said via Skype. Saeed and other activists bypassed the communications blackout by using satellite telephones to connect to the Internet. In the past, the regime has cut telephone lines and cellular networks in areas where military operations are under way, but the latest blackout was the first to cover the whole country since Syrian uprising began in March 2011. In neighboring Lebanon, tensions were running high Saturday in the northern city of Tripoli between supporters and opponents of Assads regime, which is dominated by the presidents Alawite sect, an offshoot of Shiite Islam. Lebanese troops deployed to potential flashpoints in the city  home to significant Sunni and Alawite populations and the site of deadly violence in recent months between the two communities  to prevent possible clashes. The army dispatched troops to Tripoli as a precautionary measure after an announcement Friday that 20 Lebanese Sunnis had been killed inside Syria while fighting alongside rebels, who are predominantly Sunnis as well. The city was clam Saturday. It was not clear when the funerals would be held because the bodies of the dead are still in Syria, Lebanese security officials said on condition of anonymity in line with regulations. Lebanon is particularly vulnerable to getting sucked into the conflict in Syria. The countries share a complex web of political and sectarian ties and rivalries that are easily enflamed. Lebanon, a country plagued by decades of strife, has been on edge since the uprising in Syria began, and deadly clashes between pro- and anti-Assad Lebanese groups have erupted on several occasions. In Turkey, Foreign Minister Ahmet Davutoglu said the Syrian regime has degenerated into an armed militia that resorts to brutality in an attempt to stay in power. Davutoglu spoke Saturday at an Istanbul meeting attended by Arab foreign ministers who expressed opposition to the Syrian government. Davutoglu and other delegates at the one-day conference say the Syrian regime is a threat not only to its people but also to peace and security in the region. Turkey was an ally of Syria before the crisis began but turned into one of its harshest critics because of Assads crackdown. AP writers Elizabeth A. Kennedy in Beirut and Peter Svensson in New York contributed to this report.